File Types: PNG, JPG, All Files; File Size: 11.83 MB; Tileable: Yes; Layered: Yes; DPI: 300 DPI; Vector: Yes. Fun art and patterns for kids on the move! This lively collection of transportation themed art in my Vintage color theme is great for crafts or classroom resources. Also great for making transport themed party invitations and decorations. Includes 19 transportation clipart images and 6 coordinating, seamless transportation patterns. Vector files are included for both! Each transportation clipart image is about 1800px, or 6" when printed at 300 dpi (print quality). Seamless transportation digital papers are about 3600px, or 12" when printed at 300 dpi. All clipart images have a transparent backgrounds, making them easy to just pop in where you need them! Please note that the backgrounds on the cover image is for display only, and not included in the files. 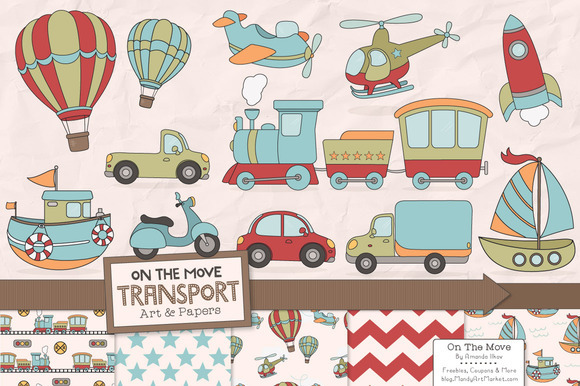 Like these Transportation Clipart & Papers? More colors and styles are available in my On The Move series! See them here. Keywords: kids transportation clipart, kids clipart, transportation clipart, transportation vectors, transportation patterns, transportation digital papers, train clipart, sailboat clipart, airplane clipart, car clipart, train clip art, transportation illustrations, hot air balloons, transportation graphics, truck clipart, style1077, amandailkov, colorvintage, vintage transporation. Best ddsign template, vectors, illustrations, video templates from creative professional designers with After Effect, PhotoShop, 3DS Max, Cinema 4D or InDesign. Full details of CreativeMarket Transportation Clipart Patterns 341070 for digital design and education. CreativeMarket Transportation Clipart Patterns 341070 desigen style information or anything related.